MOOS Project Viewer for Linux is a MS Project viewer that can open any MS Project file type (.mpp, .mpt, .mpx, .xml) for any Microsoft Project version (2000, 2003, 2007, 2010) on Linux system. 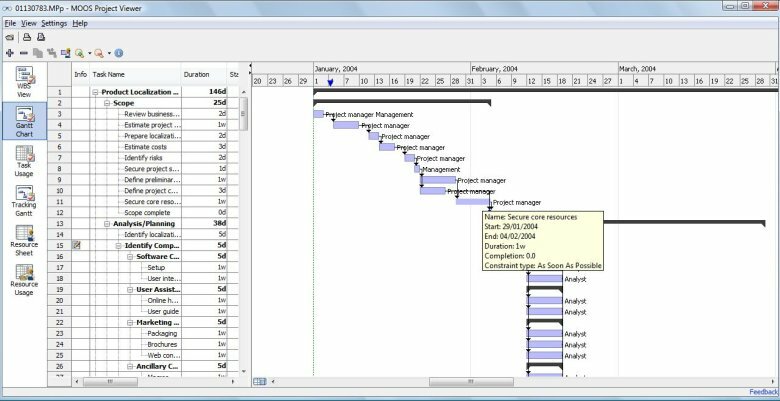 Available views: WBS, Gantt chart, task sheet, resource sheet, resource usage, tracking Gantt. It is running on any Java enabled platform for Linux and it is the perfect solution for project stakeholders to view the project details in a dynamic way. ...... Test it for yourself! Why do you need a MOOS Project Viewer for Linux? What do you get by using MOOS Project Viewer for Linux? Qweas is providing links to MOOS Project Viewer for Linux 2.7 as a courtesy, and makes no representations regarding MOOS Project Viewer for Linux or any other applications or any information related thereto. Any questions, complaints or claims regarding this application MOOS Project Viewer for Linux 2.7 must be directed to the appropriate software vendor. You may click the publisher link of MOOS Project Viewer for Linux on the top of this page to get more details about the vendor.